Doctor Who: Looking Back At THE HUNGRY EARTH | Warped Factor - Words in the Key of Geek. As we all know, Wales is now the quite literal base of Doctor Who's operations behind the scenes. But it also got its chance to shine in front of the camera as the base for a new Silurian sub-species in the two-parter The Hungry Earth/Cold Blood! Cwmtaff is the setting as the Doctor, Amy & Rory arrive just five years (2020) from what is now the present, though they were aiming for the considerably sunnier climes of Rio. Well, naturally you might be more than a little disappointed. Any thoughts of sun & samba are soon displaced in favour of investigating strange goings-on regarding a local drilling project! RORY: Not really getting the sunshine carnival vibe. DOCTOR: No? Ooo, feel that, though. What's that? Ground feels strange. Just me. Wait. That's weird. AMY: Doctor, stop trying to distract us. We're in the wrong place. Doctor, it's freezing and I've dressed for Rio. We are not stopping here. Doctor. You listening to me? It's a graveyard. You promised me a beach. DOCTOR: Blue grass. Patches of it all around the graveyard. So, Earth, 2020-ish, ten years in your future, wrong continent for Rio, I'll admit, but it's not a massive overshoot. Actually, it is. But another S is the reason for the stop-over. Well, as mentioned above it's actually three if you count the ''sub-species'' before ''Silurians''! Technicalities aside, why are they here in the first place? If you first saw them alongside the Third Doctor in The Silurians, you'll know why. They were in hibernation, and the noise from all that drilling has woken them up. First order of business, presumably after a great deal of yawning and stretching, is the continuation of their mission to take back what they regard as their Earth from the invading apes. 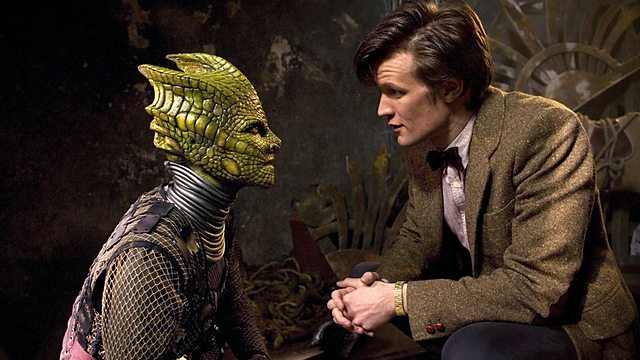 These Silurians look vastly different from any seen before, perhaps in the BBC Wales tradition of redesigning classic foes for new audiences! Evidently they're more militaristic than previous appearances, too - the rather natty reptilian face-masks hiding the most humanlike face than any worn by previous branches of homo reptilia. DOCTOR: I'm the Doctor. I've come to talk. I'm going to remove your mask. You are beautiful. Remnant of a bygone age on planet Earth. And by the way, lovely mode of travel. Geothermal currents projecting you up through a network of tunnels. Gorgeous. Mind if I sit? Now. Your people have a friend of mine. I want her back. Why did you come to the surface? What do you want? Oh, I do hate a monologue. Give us a bit back. How many are you? ALAYA: I'm the last of my species. DOCTOR: Really. No. Last of the species. The Klempari Defence. As an interrogation defence, it's a bit old hat, I'm afraid. DOCTOR: No. You're really not. Because I'm the last of my species and I know how it sits in a heart. So don't insult me. Let's start again. Tell me your name. DOCTOR: How long has your tribe been sleeping under the Earth, Alaya? It's not difficult to work out. You're three hundred million years out of your comfort zone. Question is, what woke you now? ALAYA: Our sensors detected a threat to our life support systems. The warrior class was activated to prevent the assault. We will wipe the vermin from the surface and reclaim our planet. DOCTOR: Do we have to say vermin? They're really very nice. DOCTOR: Extraordinary species. You attack them, they'll fight back. But, there's a peace to be brokered here. I can help you with that. ALAYA: This land is ours. We lived here long before the apes. DOCTOR: Doesn't give you automatic rights to it now, I'm afraid. Humans won't give up the planet. Of course the Doctor's desire to see peace between the Eocenes & humans harks back to his Third incarnation's quest for the very same. DOCTOR: But I still don't understand why you stayed down here. SILURIAN: The hibernation mechanism was faulty. It did not function until a new energy source appeared. DOCTOR: The power station at the research centre? SILURIAN: Yes. We are now able to drain off its energy. But soon we shall revive our civilisation, and reclaim the Earth for ourselves. DOCTOR: No, you mustn't, otherwise there'll be the most terrible war. But if you trust me, I think I can persuade the humans that you are prepared to live with them on this planet in peace. SILURIAN: There is not room for both civilisations. DOCTOR: Oh yes, I think there is. You see, your people are used to living in extreme heat, whereas these areas on Earth are of little interest to man. I believe with your advanced technology that you could build cities in parts of the world that man has hitherto completely ignored. SILURIAN: Would your people agree to this? DOCTOR: Well, they're not my people, but I think I could convince them, on the condition that you release those trapped men first. Tough job for the man who'd initially claimed to be from the "Ministry of Drills, Earth and Science. New Ministry, quite big, just merged. It's lot of responsibility on our shoulders. Don't like to talk about it." 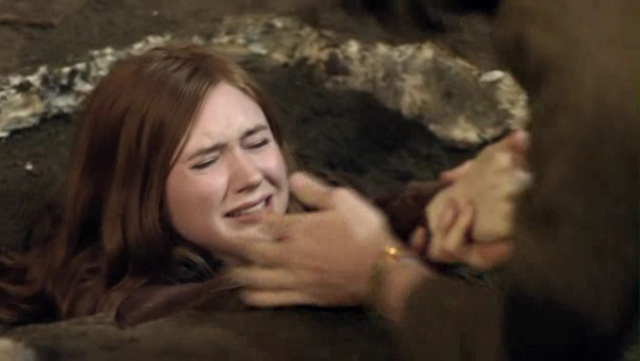 The key to the whole mystery of the reappearance of the Silurians lies underground, where they've taken several humans- whose number will soon include Amy- as hostages/subjects of experimentation. AMY: What's pulling me? What is under the earth? I don't want to suffocate under there. DOCTOR: Amy, concentrate. Don't you give up. DOCTOR: No. Amy! Amy, no! No! No! No! No! No. No! No. No. No. No. The scene is then set rather wonderfully for Cold Blood as the Doctor takes Nasreen Chaudry with him to get to the root of the rapidly escalating tension between humanity & the Silurians. DOCTOR: We're looking for a small tribal settlement probably housing around a dozen Homo Reptilia? Maybe less. DOCTOR: Ah. Maybe more than a dozen. Maybe more like an entire civilisation living beneath the Earth.